Sealing moisture out is perfect around doors and windows but sealing moisture in can grow mold and rot. 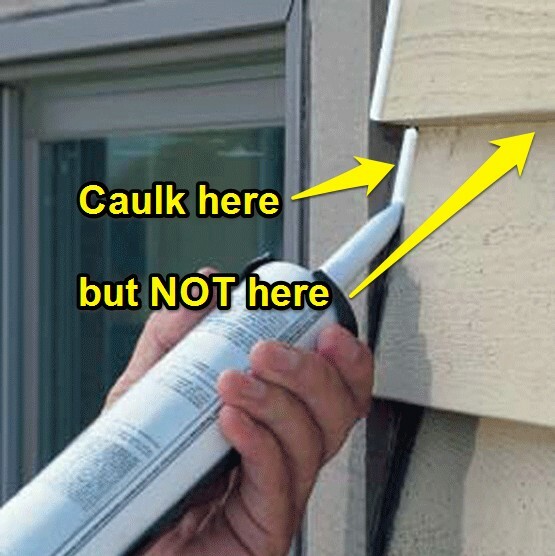 Caulk is, in terms of aesthetics, the most important part of prepping for exterior painting. It makes for a smooth, seamless appearance – no gaps between trim boards or hairline cracks in stucco. Caulk also protects from moisture infiltration. 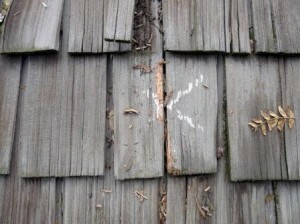 Crack sealing (wood or stucco) should not be very noticeable. It’s often done poorly and looks like a finger dragged across a blob of caulk. Which is exactly the cave-man type of repair that is so common. Ideally, a detail-oriented painter will remove excess caulk with a damp rag for a neater appearance. Sealing storm windows in solves one problem (heat loss / convection) and creates another, far worse problem (trapped moisture). Plus, there’s a much higher risk of damage on removal (say, for painting) of both the storm window itself and the window opening. There are usually weep holes or slots at the bottom edge of a storm window; they’re effective for water run-off but don’t help much with condensation. Sealing storms in leaves no path for condensation to escape. Please, be kind to your home and don’t caulk your storms in. 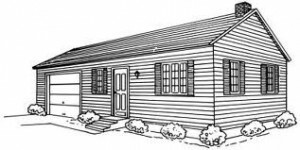 We’re talking about the bottom edge of clapboard siding and shake shingles. When (not if) moisture gets behind your home’s exterior sheathing it will need an outlet path or it will become a breeding ground for mold, mildew and wood-eating fungi. Yes, some siding boards may cup and warp; do not yield to temptation and caulk recklessly for the sake of appearance. You’ll solve one problem and create another – leave an outlet path. Your roof and gutters should be doing their job and directing water away. But sometimes they don’t and water goes where it shouldn’t. If you seal the bottom edges and joints of soffits and fascia trim you’ve effectively created a bathtub. Water will then travel where you don’t want it to or, maybe worse, it will fester and grow mold and mildew. As a general rule it’s best to follow the old adage “think like a raindrop” – if a raindrop continues its downward path will it wind up where you want it? Many contractors tout that they caulk “everything”, now you know that’s not quite the best policy. Want to know more about what not to caulk? 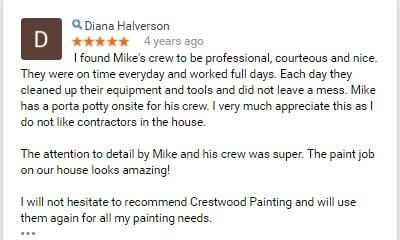 Give us a call – we’d love to help. 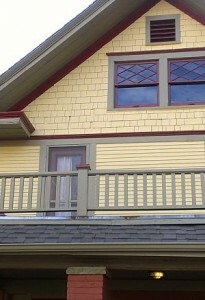 Roof color can be a factor when choosing paint colors. Roof colors (foundations too) affect paint color choices. Color expert Diane Stewart atColor Sense Consulting gives her take on how to tackle this situation. Sometimes my clients seem surprised when I point out that that their roof shingles are considered part of the exterior color scheme. Just like the undertones of brick or stonework, the color of the roof is part of the equation. It may be higher up, but it’s usually visible from the street level.